First things first: your company needs a CRM. But before you leap into something new, keep in mind these 7 considerations when choosing your company’s CRM. Your company’s CRM extends through the entire organization. Without it, you won’t be able to communicate effectively, and the disconnect will affect your customers’ experience. The CRM you choose will allow you to centrally maintain important data that every department in your company requires access to: marketing, sales, HR, and accounts payable. Without it, the challenges are enormous. Unfortunately, many small businesses discount the importance of CRM and use Excel spreadsheets to track their activities. Some keep notes in a variety of different silos that make it difficult to track all the efforts that have been made. If you don’t already have an actual CRM, you need one. When you’re in the market for a CRM, don’t make the mistake of choosing the cheapest or simplest option. Even if it’s your first time choosing a CRM, use this list to help you choose the best one for your company. 1. Your CRM should be customizable. The sales process looks different in every industry. Your buyers will buy differently and follow a different buyer’s experience than buyers in other segments of the market. You must be able to customize your CRM to match your buyers’ needs. Customization allows your team to organize their sales processes, and their KPIs, based upon the way your buyers buy. 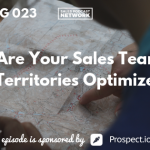 It also speeds up your close rate significantly because your salespeople can carry out activities in the order that makes buyers most comfortable. Additionally, if you can add fields that are relevant to your industry, it often gives your team ownership in the process and increases the chances of successfully adopting the CRM. It isn’t always the best idea to buy a CRM that is specifically designed for our industry because the program might limit your capabilities. When you can find a CRM that is agnostic and provides flexibility to the users, it helps the team perform better and sell more. 2. Choose a CRM that is easy to use. It seems self-explanatory that if your CRM is hard to use, your team will avoid it. If the process slows them down unnecessarily, it may be difficult to convince them to fully embrace it. Does your CRM have drag-and-drop capabilities? Is it easy for your team to add notes or information? Is there a mobile application so you can access information virtually? Can leaders create reports easily? Your team must be able to record important information gathered during appointments, so they must have an easy-to-use CRM that allows them to record information quickly, from anywhere. When you have to make important decisions about your prospects and your sales funnel, your CRM must make it easy for you to gather what you need. 3. Your CRM must allow integration. Fortunately, many CRMs offer integration capabilities now that allow you to combine the power of all your sales tools. These may be native integrations, or they may be powered by Zapier. If a CRM doesn’t allow integration, it won’t work effectively for your team. Your CRM should allow your team to send mail through Gmail or Outlook and those communications should be automatically added to the deal or contact. Integration is a huge time saver for your team given that most of our communication with prospects happens via email. Additionally, you should be able to integrate into your marketing platform. This capability will help your marketing team make important decisions about buyer behaviors. How do they interact on our website? Can we use lead scoring to our benefit? How can we convert marketing qualified leads into sales qualified leads? 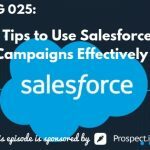 This capability will help develop effective marketing campaigns as well as making sure the sales team gets the right leads. Finally, your CRM should integrate with sales automation platforms like prospect.io and LeadIQ. It should integrate with your financial software and with other crucial software you use to run your business. It should allow you to add custom APIs. 4. Find a CRM that offers training. Although it’s important to find a CRM that is easy to use, it’s also important to find one that offers some level of training, such as online videos, webinars, FAQs, or customer service reps who will help your team get started. If your CRM sits on the shelf unused, it isn’t helping your company. Can the company work with your sales team to get you started using the CRM as quickly as possible? The time that your company invests into learning the CRM represents time taken away from the business. Consider a CRM that doesn’t require you to reinvent the wheel but that can give you the shortcuts and guidance you need to use it effectively. 5. Consider how your management will be involved with the CRM. If management doesn’t use your CRM, the sales team will be less likely to use it. Your management must be involved with the CRM. Leaders must take an active role in using and referring to the CRM. This will give them a pulse on the sales process and will help them understand the health of the clients and the performance of the sellers. This information will be crucial as leaders seek to coach sellers to perform to the best of their abilities. 6. Your CRM should be user-friendly for all departments. Your sales success depends on the team’s ability to use your CRM well. If Client Success needs to post the close of a new deal, how easy is the transition from prospect to customer? What milestones exist to ensure that onboarding is successful? Is there a workflow process that will track payments? Can marketing monitor the success of the client to later use for testimonials? Organizations realize the need to break down silos and improve communication through the entire organization, and the CRM can play a major role in that capability. 7. Your CRM must be able to grow and scale. As your team grows, you must have a CRM that allows you to purchase additional licenses as you need them without having to purchase more than you require. A CRM that requires you to purchase more than you need is wasteful. Additionally, you must have the ability to retract licenses as well. When people leave your team, you must be able to deactivate their licenses, ideally without having to involve customer service. These aren’t the only important considerations when choosing a CRM, and the requirements will largely shift based upon your company’s industry and needs. These are simply guidelines that most companies should consider as some of the most common needs companies have in their CRM. To be sure you’re getting the right one, gather your end-users and department heads to seek their input about capabilities and features. Have a discussion about workflow and the buying process. Is there a single CRM that can help you maximize your success? 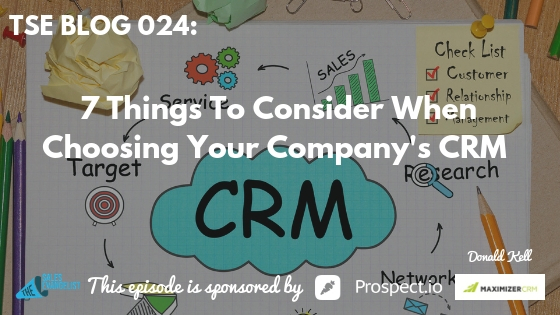 I’ve used many CRMs over the years, and I love Maximizer, Pipeline Deals, and Hubspot CRM. Remember as you make your decision that your organization must be able to communicate well, and they must be willing to use it. Your CRM is about growth.